The diaspora of people of African descent doesn't usually include large migrations of free people of color from Louisiana in the years preceding the Civil War. In fact, little is known about such groups except that they left the state seeking equality and freedom from racism in countries such as Haiti, France, Cuba and Mexico. It also is not known what became of their descendants, whether they maintained family and cultural ties with Louisiana or not, and how they identify ethnically. See larger version of this map... today in their country of birth. What does their Louisiana Creole heritage mean to them after a century and a half removed from it? existed throughout French colonies in the Western Hemishpere. Mary Gehman began her research in 1998 into the hundreds of these families who, according to historic references, went to Mexico in the late 1850s. 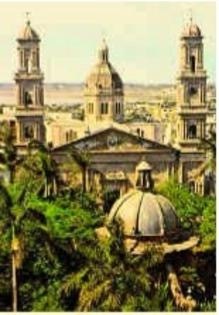 She located them along the Gulf of Mexico between the port cities of Tampico and Veracruz. Through archival records and interviews with their descendants, who still live in those cities and in small villages along the coast, she was able to construct a data base of names and a picture of what their lives were like in the 19th century. Although they no longer speak French and have in fact lost all contact with Louisiana and their Creole roots, the Mexicans continue to cook some of the dishes handed down through generations and intermarry and socialize in many cases with others of the same heritage. They were surprised to hear that their French surnames are still common in Louisiana and were excited to meet Gehman and learn a more factual account of their history. Gehman published this article about her research in Louisiana Cultural Vistas, the magazine for the Louisiana Endowment for the Humanities, winter 2000-2001 edition. She continues to visit Mexico, and to collect names and contacts. She is working to reunite long lost relatives from both sides of the border. Her database is available to genealogists and anyone who is searching for family members who may have been part of the 19th century emigration to Mexico. She also lectures with a slide presentation of the material. The family trees of many people in Louisiana tend to have missing branches. There may be a baptism certificate for a great-great-uncle at the local Catholic church, perhaps a marriage certificate later and a deed to property and records of one or two childrenbut there the line ends. No one knows what happened to this distant relative and his heirs. An elderly relative might vaguely remember hearing that long ago many acquaintances migrated to Mexico while others shipped out for France or Haiti, if they had other family residing there. Little if anything has ever been written on these elusive emigres. They lost all contact with their families in Louisiana. Their descendants' names remain blank lines on genealogical charts, popular today with a new generation researching ancestral history. This is especially true for many Creoles who descended from free people of color - popularly called "les gens de couleur libre." Mixed with French, Spanish, African, Indian or even German, Irish, or Italian bloodlines, the free people of color lived a tenuous existence in a caste-like system of antebellum Louisiana divided among three groups: whites in the upper caste, black slaves in the lower, and the free people of color in between. These Creoles were free to move about as they pleased, conduct commerce and trade, buy and sell property - including real estate and slaves - as well as serve in the militia and attend cathedral, opera, theater, and Free Masons meetings. Political office and the vote, however, were denied, and they could not intermarry with whites. In the 1850s, as abolitionists infiltrated Louisiana's churches and social institutions with the message of serious conflict between North and South, free people of color became increasingly more of a liability to Louisiana's white population. Free people of color were generally well to do, well educated, and dominated trades such as leather working, iron making, and cigar rolling. They also had their own journalists, writers, educators and orators. They owned significant holdings in real estate, invested heavily in local banks, and lent money to many whites. But their financial and social clout was about to change. Fearing an alliance between free people of color and rebellious slaves, Louisiana's whites, who were then a minority, attempted to reassert their authority and limit freedoms once taken for granted among free blacks. New regulations required free people of color to register with local municipal officers so that their numbers, locations, and professions could be monitored. It became illegal for them to assemble in groups of more than a few people and they were not allowed to leave Louisiana without permission. A white sponsor was required whenever they conducted business and they were obligated to carry papers proving their free status at all times. As if these restrictions were not humiliating enough, free blacks now had to observe the 9 p.m. curfew imposed on slaves. Understandably, leaders among the free people of color were outraged by these restrictions. In response, many began liquidating their real estate and business holdings and transferring the proceeds to foreign banks. Free blacks with young families and long futures ahead of them saw greater opportunity beyond the borders of Louisiana and prepared to leave. One of the few written accounts of this migration is mentioned by Rudoiphe Lucien Desdunes, a free man of color, in his book Nos Hommes et notre Histoire published in 1911: "[In 1855] Mr. [Lolo] Mansion generously donated a part of his fortune for the relief of our people, and a number of them profited by his generosity, escaping the hardships of prejudice. Mexico and Haiti opened their doors to them." The New Orleans Daily Delta newspaper of January 15, 1860, ran an article on the "exodus of free persons for Mexico and Haiti." The 1994 book, Creoles of Color in the Bayou Country, by Carl A. Brasseaux and others, states that in 1870 "many... Opelousas and Attakapas expatriates chose to join the free black colony near Veracruz. Some became merchants, engaging in trade with New Orleans." Downtown Tampico has a distinctly New Orleans look. It is well established that many such people went to Mexico, but there is little if any information about what part of Mexico they settled in, what conditions were like for them in a foreign land, or whether or not they retained their Louisiana culture and French language. Could there really be a Louisiana Creole community in Mexico? A thorough search of a book on black history in Mexico, La Poblacion Negra de Mexico (The Black Population of Mexico) by Gonzalo Aguirre Beltran, along with his various other works on the subject, makes no reference to free blacks from Louisiana. ​Answers must lie then in primary sources: civil and church records interviews with Mexicans who have Louisiana roots, and observations about their culture and cuisine. That is a project I have undertaken, making several trips to Mexico, collecting data from national and regional records, and meeting with Mexicans who are aware that their ancestors came from Louisiana but with no knowledge as to why. They have no connection to distant cousins still residing in the state. The stories of these Mexican-Creole descendants are poignant, laced with myths and cobbled together from oral histories with a need to recreate a past not clearly conveyed by their great-grandparents. Their ancestors, émigrés from persecution, left a painful situation in the United States in hopes of giving their children a new life free from racial tension and inferiority. ​Some descendants believe their Louisiana ancestors fought in the French Army during the invasion of Mexico under the self-appointed emperor Maximilian (1862-1867), although no proof exists; others insist the lure of Mexico was strictly economic. They attribute the cutting of all ties with family in the United States to poor communication via letters or expensive travel of that era. Some assume the whole family moved, leaving behind no relatives. A few mention aunts or uncles who moved to California but rarely wrote or visited thereafter. There are stories of Mexican land grants signed by President Benito Juarez, or permits to leave the United States signed by Abraham Lincoln, but these exist in memory, not fact. Louisiana's offspring in Mexico are today fully acculturated Mexicans, many having married local people of Spanish or Italian descent. Because Mexicans use the surnames of both their mother and father, in that order, one hears among them the combination of one French and one Spanish surname. Jose Olivier Garcia, for example, which indicates a mother from Louisiana and a father from Mexico. The families' facial features, hair, and skin tone reflect the same wide range of racial and ethnic mixes seen in Louisiana. 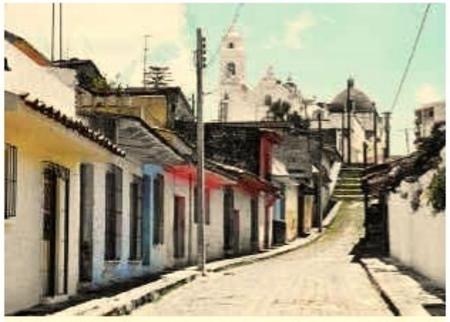 Alley of Jesus te ampare in Jalapa, the capital of the state of Veracruz. Fortunately, verified information about Louisiana émigrés to Mexico does exist in church and civil records. Vestiges of Louisiana Creole heritage remain, such as the cultivating of okra and use of it in gumbo,above-ground cemeteries, and family reunions that reinforce familial ties. Though the French language is no longer spoken, there is still pride in having come from French stock. Most are curious about their Louisiana history and would like to reestablish ties with family in the state. They are unaware of the role that race played in their ancestors' decision to leave their homeland. They are somewhat confused as to why race continues to separate people in Louisiana and why their American relatives, whose heritage is predominantly European, would be identified as African Americans. 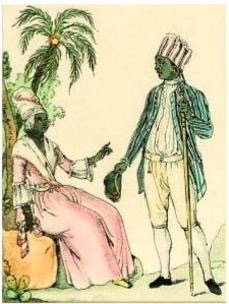 The term Creole is difficult for this community to associate with themselves since Creoles in Mexico no longer exist. Contrary to the Louisiana definition of Creole as anyone born in the colony, historically Mexican Creoles were children or grandchildren of the Spaniards sent by the king of Spain to rule Mexico during its nearly three centuries as a Spanish colony. These Creoles were a ruling and landowning class slightly below that of the Peninsulares, the king's appointees from Spain, and vastly superior to the more common mestizos, the combination of Spanish, black, Indian, or any other ethnicity in modern Mexico, the term Creole is relegated to historical documents. In that sense, even the title of this article would likely be misunderstood in Mexico today. Records in Mexico and information imparted by the families reveal a history of migration back and forth from Louisiana by several different groups in direct response to politics of the time. The first wave left Louisiana in the late 1850s to settle along Mexico's Gulf coast between the port cities of Tampico and Veracruz. Some returned after the Civil War when Reconstruction eased the plight of free people of color. The second wave of migration to Mexico - often the children of the previous generation - occurred in the 1880s through the end of the 19th century as racial segregation became institutionalized in Louisiana. Both waves of migration had two distinct components: urban and rural. 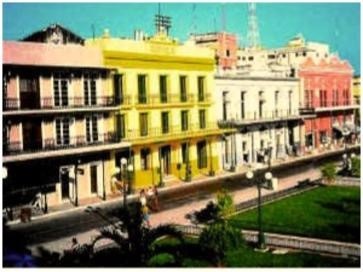 In the cities of Tampico and Veracruz, Louisiana's Creoles who were already artisans and merchants, previously well established in New Orleans, set up bakeries, shoe factories, tailoring shops, and restaurants, or found employment as carpenters, construction workers, and iron workers. Others became professionals: teachers, musicians, engineers, and import-exporters. In contrast, the rural component settled in the fertile coastal areas of the state of Veracruz, approximately 100 miles north of the city of Veracruz. There the descendants of cattlemen, ranchers, and farmers from the Louisiana parishes of St. Landry, St. Martin, and St. Mary now make their home. They continue to farm large haciendas on the original homesteads of San Antonio, Bella Vista, Coronado, Barrilles, and Santa Rosa while their homes are in the nearby villages of Papantla, Cabezas (now renamed Gutierrez Zamora), Tecolutla, and Tuxpan. Where once their forefathers cultivated sugar cane, tobacco, and cattle-as they had in Louisianathe farms today are primarily planted in orange groves for the lucrative citrus concentrate market abroad. 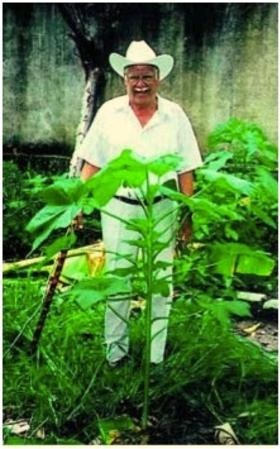 shows off his okra plant used in making gumbo. Emigration to Mexico was a weighty but necessary decision. Few Louisiana expatriates left any written indication of their feelings regarding the move. But in a letter obtained from a family in New Orleans, Isidore Bordenave, from the city of Gutierrez Zamora, Mexico, wrote on Sept. 20, 1909, to his sister-in-law, Mrs. S. Bordenave, back home in Louisiana, what must have been the sentiments of many. Referring to his recent visit to the family in New Orleans, he wrote, "I still enjoy the company of you all. I am deprived of it, but at the same time it cannot be helped. New Orleans is a dead city for me. Here I enjoy life-in a desert, it's true, but life without any of the foolishness that makes the American Republic a dark ship... Those few days I have spent with you all have been very pleasant, but, at the same time, to see that I was unable, due to prejudice, to act as I would here, bled my heart and left a dark veil on the good time enjoyed." Bordenave died and was buried in Gutierrez Zamora in 1923. Transportation to and within Mexico was by water. Passenger lists from ships of the time show dozens of young men, some married with one or two children, leaving together from New Orleans or the Port of St. Mary Parish. There was already a well established trade route between New Orleans, Tampico, Veracruz, and Havana with stops at smaller ports in between. Some of the newcomers had business ties with Mexico and Cuba which doubtlessly helped them settle into their new home country with ease. Others bought into settlement arrangements operated by men from Louisiana who brokered land deals. 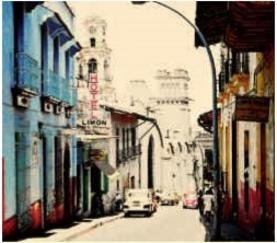 Many émigrés retained their U.S. citizenship and traveled back and forth in the early years between Mexico, Cuba, and Louisiana for business and personal reasons. Second and third generations, however, lost all contact with their Louisiana relatives. The Eureka Colony is an example of a brokered land deal. In 1859, Louis Nelson Foucher, a well known free man of color from New Orleans who had distinguished himself in architecture and mathematics, contracted with a wealthy Mexican family to purchase a large area of fertile farmland with access to the Panuco River south of Tampico. There he settled, along with 100 families from New Orleans. The project was short lived since sketchy records indicate that Eureka Colony burned in 1861 and that the families who were to move there instead relocated to Tampico. 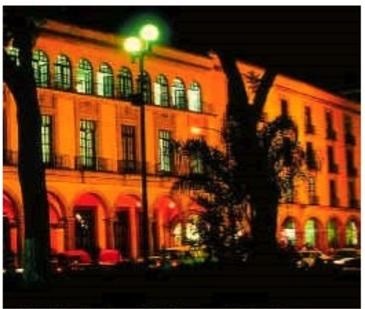 Municiapl palace in Jalapa, capital of the state of Veracruz. Of interest to musicologists is the family of Thomas Marcos Tio, a musician and teacher from New Orleans who was among the settlers ot Eureka Colony. His sons, Louis and Lorenzo Tio, were born and raised in Tampico. In 1877 Mrs. Tio and the children moved back to New Orleans where Louis and Lorenzo, dubbed by locals as "the Mexicans," were clarinetists. They worked as musical arrangers in marching bands and minstrel shows and eventually figured prominently in the development of jazz. Their father remained in Tampico until his death in 1881. The migration of free people of color from Louisiana to Mexico in large numbers in the late 1850s was very possibly due in part to the influence of the wildly popular president of Mexico at the time, Benito Juarez (18061872). 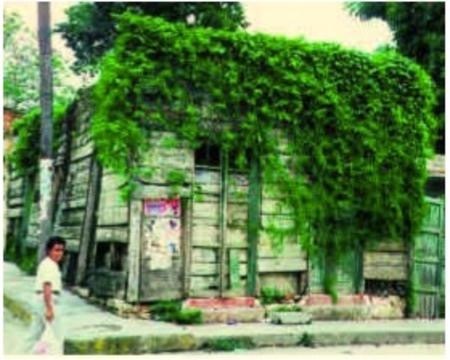 Although no direct link can be documented thus far, people in Mexico are well aware that Juarez spent 18 months in political exile in New Orleans from December 1853 to June 1855, rolling cigars in the French Quarter to make ends meet. He associated openly with free men of color. It is also known that he took room and board at the home of a free woman of color on Royal Street and was nursed - probably by her - through a bout of yellow fever in 1854. Gehman interviews the Probo (Provost) family in Guiterrez Zamora. A full-blooded Indian, Juarez suffered racial discrimination during his New Orleans stay. Certainly he was aware of the ever more precarious position of the free blacks in the city and very likely offered to send for them once he returned to Mexico. Along with other renegade Mexican politicos headquartered in New Orleans at the time - including Melchor Ocampo and Guillermo Prieto - Juarez risked returning to his homeland to shape a new constitution and lead the chaotic government in 1857. He saw the need for hardworking, stable families, like the ones he had met in New Orleans, to settle the country. Except for the interruption of the Juarez tenure by French military occupation between 1862 and 1867, Louisiana families of color were welcomed by Mexican leaders. There is no evidence that they participated in the military or government under Juarez but some descendants recall talk of land grants and business associations with the Juarez regime. One significant result of research into Louisiana's exiles in Mexico has been the discovery of direct descendants of Henriette Delille, the free woman of color who founded an order of nuns of African descent, the Sisters of the Holy Family, in New Orleans in 1846. Delille is currently under consideration for canonization at the Vatican. Her great-nephew Bernard Vincent, and his wife Celeste Simms, left Opelousas, Louisiana, with their two young children in 1891 for Cabezas, Mexico, where they prospered and added another 11 children to their family. Two granddaughters of Bernard Vincent and one great-granddaughter - who bears a striking physical resemblance to Delille - visited the Sisters at their convent in New Orleans in 1999 to share their family's history, thus becoming the first Delille relatives to be discovered by the order. These Mexican-Louisiana Creoles are among many who were delighted to make contact with their original heritage and to discover that there are still people with their names and faces here. They tell of grandparents and great grandparents who struggled with the language, customs, and frontier conditions of Mexico in the early years. They survived, their children assimilated with the local population, and today they are thriving. 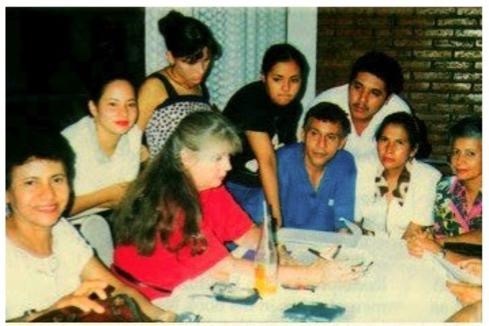 In some communities they have retained their close family connections, serving as godparents to each other's newborns, visiting family tombs on All Saints Day, and gathering at a local restaurant run by Dona Julia Pinta, a Mexican equivalent of Leah Chase's "Dooky Chase" restaurant in New Orleans. They ask, would their Louisiana relatives welcome them? Would the two sides have anything in common after years of separation? To see their ready smiles and animated conversations, there is no doubt they would. 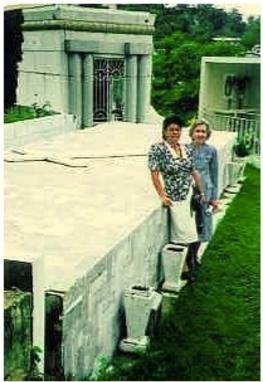 Above-ground cemataries and All Saints Day observations are common in the region of Mexico where free people of color migrated. © 2000 Mary Gehman, All Rights Reserved.